In May 2017, the people of Greater Manchester elected Andy Burnham as GM Mayor. 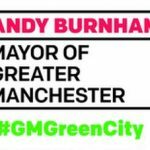 In his manifesto, he committed to a new, accelerated ambition for Greater Manchester on the green economy and carbon neutrality, building on the leadership of the six local authorities that signed a 100% clean energy pledge in 2015. Ahead of the Green Summit on March 21st, the Greater Manchester Combined Authority commissioned the world-leading Tyndall Centre for Climate Change Research at the University of Manchester to provide an evidence-based answer to the question of what that “new goal” for carbon neutrality should be. * achieve carbon neutrality by 2038. While this may be challenging, it is not unprecedented – many countries, cities and corporations around the world have already pledged to be ‘zero-carbon’ or ‘carbon-neutral’ far ahead of 2050. We have compiled the table below to highlight some of the countries, cities/regions and corporations / organisations that have committed to going “carbon neutral” or “zero carbon” before the 2050 deadline. However, as there is not yet a standard definition of what the different terms mean, pledging to go ‘carbon neutral‘, “zero carbon” or “zero net carbon” often means different things to different people. Is a business referring to just their energy use or their entire operations? Is a city or country taking into account embedded emissions from manufacture and production in other countries or the impact of airports and aviation? Greater Manchester has identified an evidence-based ‘carbon budget‘ – the challenge now is to work together to make it happen. If you don’t see your business, school, university, public sector organisation listed below – why not ask them what they are doing to reduce their ‘carbon emissions’ and when they will be ‘zero carbon’ or ‘carbon neutral’? If they are listed, why not ask them how they are going to succeed. Costa Rica: pledges carbon neutrality by 2021. Mace: Going carbon neutral by 2022. The Ollerton Group: believes in protecting our environment for our future generations and aims to become carbon neutral by 2022. Brighton & Hove: working towards becoming a ‘One Planet’ region, endorsed by BioRegional. The objective is for all buildings and structures over which the local authority has direct influence to be ‘net zero carbon’. A detailed plan for achieving zero carbon by 2025 will be put in place within three years of writing the One Planet Action Plan. Gateshead: As part of the Council’s 2030 vision, it is planned to make Gateshead carbon neutral by 2025. Joensuu (Finland): The city of Joensuu has set itself the objective of reducing greenhouse gas emissions and becoming carbon neutral by 2025. Missoula (Montana, USA): City Council passes plan to be carbon neutral by 2025. Loyola University (Chicago, USA): Carbon neutral by 2025. SAP: to go Carbon Neutral by 2025. Arthur Hotel Group (Copenhagen, Denmark): to become the first carbon-neutral hotel group in the world. Macalester College (USA): committed to being carbon neutral by 2025. University of California (USA): UC, a national leader in sustainability, has pledged to become carbon neutral by 2025, becoming the first major university to accomplish this achievement. University of Sheffield: Carbon Neutral University Network. An open network of students, staff and the general public committed to encouraging and developing solutions to support the University of Sheffield to become Carbon Neutral by 2025. WSP: set a target for its entire UK business to become carbon neutral by 2025. Cleveland Clinic (USA): recently announced plans to become carbon-neutral by 2027. Northumbrian Water: aims to become carbon neutral by 2027 by converting all sewage sludge into energy through anaerobic digestion, improving energy efficiency and purchasing zero-carbon electricity. baseline our carbon use and then begin work to become carbon neutral by 2028. Sonderborg (Denmark): zero carbon masterplan by 2029. Norway: pledges to become climate neutral by 2030. Parliament approves radical proposal of accelerated emissions cuts and carbon offsetting to achieve climate goal 20 years earlier than planned. Wales: public sector to be carbon neutral by 2030. Bristol: plans to become carbon neutral by 2030. Christchurch (New Zealand): has set itself a target of becoming net carbon neutral by 2030. Espoo (Finland): Carbon neutral by 2030. Oslo (Norway): Carbon Neutral by 2030. Vancouver (Canada): first major city in North America to target zero carbon emissions by 2030/a>. The goal includes plans to make all new buildings emission-free by 2030 — meaning ultra-energy-efficient new buildings will soon be common in Vancouver. Siemens: carbon-neutral operations by 2030. See also: Strong business case to go carbon neutral. University of Bristol: Aiming to become a net carbon neutral campus by 2030. Brisbane (Australia): says it will become carbon neutral by 2031. Park City (Utah, USA): carbon neutral by 2032. Gettysburg College (USA): strive to achieve carbon neutrality by its 200th anniversary in 2032. Niestal (Germany): municipality’s declared goal to become carbon neutral by 2034. Helsinki (Finland): seeks to Be Carbon Neutral by 2035. Montgomery County (Maryland, USA): adopts IgCC and commits to zero carbon by 2035. San Luis Obispo (California, USA): wants to be carbon-neutral 10 years faster than the rest of California. Tampere (Finland): aims to become carbon neutral by 2035. >Vaasa (Finland): aims to be carbon-neutral by 2035. Cornell University (USA): plans to be carbon neutral by 2035. ESB (Ireland): Carbon-neutral generator by 2035. Iberdrola (USA): committed itself to gradually phasing out its emissions, so as to be carbon neutral by 2035. Iceland: Prime Minister announces plan for Carbon-Neutral Iceland by 2040. Des Moines (Iowa, USA): still following its goals–which were set back in 2015–to reduce emissions by 25% by 2020, 50% by 2030, and be carbon neutral by 2040. Liverpool: I have also pledged to at long-last harness the power of the River Mersey to spearhead our aim to be carbon neutral by 2040. Reykjavík (Iceland): plans to reduce its greenhouse gas emissions to zero by 2040 by reversing urban sprawl and promoting walking, cycling and public transport. Santa Fe (USA): goal of being carbon neutral by 2040. Stockholm (Sweden): carbon neutral / fossil-free by 2040. Turku (Finland): Carbon-neutral by 2040 – see 2029 update. Mars: committed to making its roughly 150 factories worldwide carbon neutral by the year 2040. McGill University (Canada): aims to become carbon neutral by 2040. University of Edinburgh: committed to become zero carbon by 2040. The University’s Climate Strategy 2016 lays out a comprehensive whole institution approach to climate change mitigation and adaptation in order to achieve its ambitious targets. University of Portland (Oregon, USA): Carbon neutral by 2040. Sweden: committed to cutting its net carbon emissions to zero by 2045, becoming the first country to significantly upgrade its carbon ambitions since the Paris accord in 2015. The law was drawn up by a cross-party committee and passed with an overwhelming majority in parliament by 254 votes to 41. Hawaii: Governor David Ige (D) signed a bill implementing the most ambitious climate law in the United States. The new law, which comes into effect July 1, sets the goal for the state to become carbon neutral by 2045.